Our total staffing numbers fluctuate between 12 and 14 and even though this is a small team, we are all very effective. Our process for recruiting new staff members is very vigorous as we must all meet the requirements of gaining a Security License plus be able to work in a close knit environment with existing staff. Craig Shepherd is the boss and has been in the industry for 40 years – you’d never know it to look at the photos of him on this website. It’s Craig that will come out to your site if any quotes or advice are required that are beyond the scope of our technical staff. People think that we have a large crew of technicians, but generally there are four or five. 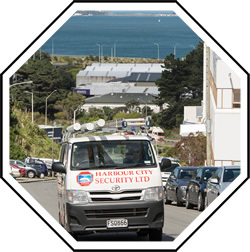 They can cover many kilometres every week going from the Kapiti Coast, to the Wairarapa and all over the Greater Wellington District so their vehicles are seen out and about a lot. 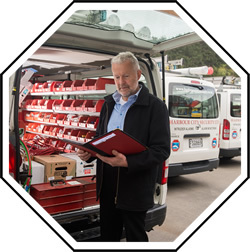 The combined total number of years’ security industry experience for our technicians is over 46. This means that they are able to work on any alarm panel that we come across and believe me we’ve seen it all, including one many years ago that had been put together in a biscuit tin. We still managed to hook it up and get it monitored. The monitoring centre is staffed by people working rotating shifts however our long term clients still become “friendly” with them all, so long as you know your voice code. It takes a certain type of person to work in an alarm monitoring centre as they are regularly dealing with people in the middle of the night, in stressful situations, whether it’s because an alarm has activated and they can’t ascertain why or someone has forgotten their PIN code and can’t turn the alarm off. Our operators will do their best to try and resolve various alarm faults for our clients during the night shifts to avoid where possible an after-hours callout by a technician. The office is staffed by two ladies, Liz and Julie. These ladies are the first in line to answer our clients technical, sales and accounts queries. So they wear many hats each day. Again we will do our utmost to diagnose alarm faults over the phone to either avoid technical callouts, if it’s something that the client can resolve, or to give the technical staff who are going to attend a good heads up of the fault. There is a difference between operating a company in Wellington, and being a company that’s part of Wellington. We like it here, we like working here and we’re proud of who we are. We are involved in the community through various funding and sponsorship arrangements, and although we don’t like to make a big deal about it we are happy to be able to be a part of our city. Our prime sponsorships are Wellington Free Ambulance and Massey University Wildbase. We figure they are great causes which benefit everyone in the community. We also sponsor and support other charities, and provide free or low cost services to others. It’s our way of keeping Wellington a nice place to live and work. As well as securing your property and valuable assets, we are also passionate about securing the future of our beautiful City through sustainability. We staunchly recycle alarm panels, electronic PCB’s and old computer equipment, cable, cardboard, copper, metal, plastic and glass. We upcycle timber pallets for firewood and all office paper and newspaper is shredded and used by Wellington Bird Rehabilitation Trust for bedding, then green-wasted and turned into compost. Even our kitchen food scraps don’t go to waste… they feed our resident worm farm which further sustains our vege garden!